Mom's Gone Bronson! : Get Those Whites Pearly This Season! Say HI to hello! Get Those Whites Pearly This Season! Say HI to hello! Every year I like to pop a toothbrush into my children's stocking for Christmas and this year I shall do the same - except I shall be encouraging the kids to use this fabulous toothpaste from a new company I hadn't heard of [until now] called: hello. This "Seriously Friendly Oral Care" company is 99% natural as far as their toothpaste, mouthwash and mouth spray are concerned and their toothbrushes are 50% recycled, which I am always happy to see! Hello supplies comes in various flavors like Supermint, Pink Grapefruit Mint, Mojito Mint and Sweet Cinnamint, of which I had the chance to try out the Supermint, Mojito Mint and the Pink Grapefruit Mint! I have to admit that I wasn't overly sure about the Pink Grapefruit Mint [not being a lover of grapefruit] but it actually was my favorite of the three! It isn't as hard hitting as a regular grapefruit taste and is somewhat softened by the mint faction in it! I love the lively pink colored packaging, too - fun! The toothpaste being 99% natural is a bonus as I am always trying to keep any unnecessary additives or ingredients down to a bare minimum and 99%, while not 100% is GREAT and for the price, availability, look and taste you really just can't go wrong! The mouth sprays are tiny little almost-egg-shaped sprays that fit into the palm of your hand and should be easy to find in your bag, while rummaging around for it, because of its raised lettering and the design itself! It also has a lock feature so you're not likely to spray it unwittingly in your bag, but you're going to have quick access to the spray, with a quick twist, when you need it! I didn't get a chance to try out the mouthwash, but it corresponds with the flavors of toothpaste available and would make for a fabulous oral care routine if you were to combine the two and then use the matching spray when you needed to throughout the day! The toothpaste left my mouth nice, fresh and clean feeling with not of that gritty, bitty-ness that I find you can get with SOME of the closer-to-natural toothpastes on the market today! The paste was smooth, and encased in an easy hold bottle and when applying it to my toothbrush I almost felt like I was decorating a splendid cake as the past comes out with a slight pattern from the shape of the outlet from which you squeeze it - it is the small things like that that made me like it even more! I have been using the paste for a few days now and my mouth always feels well brushed and clean and I do follow up with the spray just to keep up that feeling of freshness! The spray is so cute and sweet looking and it should be hard to fall in love with an inanimate object bit these are just so cute that it is harder not to treat it like a little friend hiding away in your bag ready to freshen up your breath the moment you need it! I feel as though my whole family benefits from this kind of product, with less fluoride (not zero but less than regular), no artificial sweeteners and no artificial colors but great taste, easy application and no alcohol either! Overall a great packaged, well colored, super flavored, easy to use and love product that each person inthe family can appreciate and enjoy, while doing such a menial task like brushing your chompers!! Fabulous, in my book as an every day necessity and super as a stocking stuffer this Christmas so that the kids (and the rest of your family) get to keep their pearly whites, white and their smile for longer - I absolutely would happily recommend! If you have any queries about hello, you can visit them HERE at their website or, alternatively, look them up on FACEBOOK and TWITTER to keep up with the latest news, and perhaps pick some up for yourselves or loved ones before the year is out!! 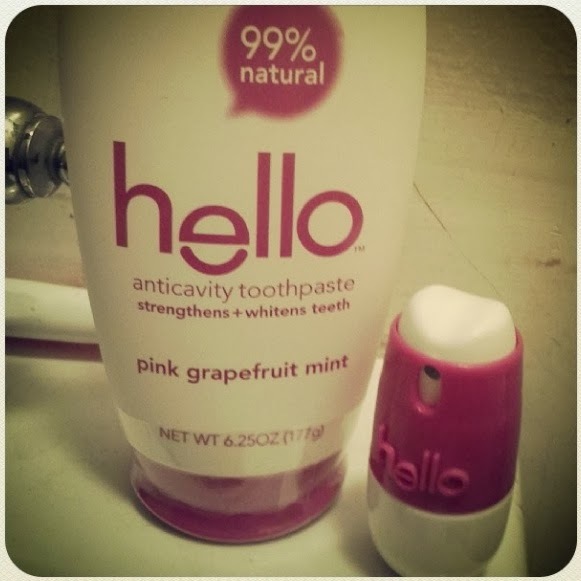 I would love to know if you've tried hello already, an just what you think!? These items all make it into our Holiday Gift Guide this year as it is never too late to encourage good oral hygiene and this [in my opinion] isn't a bad way to do it at all! Here're to a happy mouth this holiday season! Disclaimer: I was given products in exchange for this review. My opinions are honest and my own, your views may differ, thanks! Oh no I haven't tried this yet but I intend too! Thank you for introducing me! Wow, Hello seems like exactly what my husband needs! He has such sensitive teeth! Hello products rock! I am a huge liberal, always looking for environmentally safe products! Reduce, Reuse, Recycle!!!! !